Sawbaidee from Laos, the second country on our Southeast Asian tour. The whole "how to get to northern Laos" question consumed a lot of our time in Chiang Mai, as we bounced strategies off friends and family and asked any other traveler we could find who had been through Laos. The quandary was that the most direct way from Chiang Mai was to go up through Chiang Rai to Chiang Kong on the border, cross the Mekong, and then take a bus from Huay Xai up to Luang Nam Tha. The downside was that it was supposed to be 120 miles of the (or at least one of the) worst road in Laos, taking 8-10 hours. (You could also take a boat from Huay Xai, but a) those took 2 long days instead of one, b) they were much more expensive, c) they were open to the sun and relatively uncomfortable and d) slow boat rides of more than 1 day just make me nervous and stir crazy.) 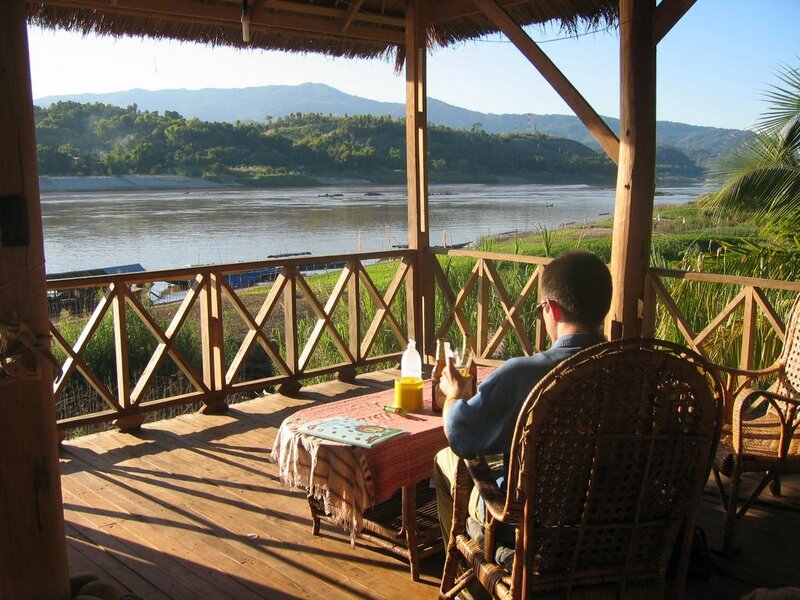 As we were a little intimidated by this trip, Brian also looked into an easier option: flying from Chiang Mai to Luang Prabang and then taking the bus 8 hours back up to Luang Nam Tha on a slightly better road. After much back and forth, we decided to go for the full backpacker experience and headed north early on new years' day. We started out on a nice Thai bus (complete with air con, snacks and drinks, and a Thai movie (a tense psychological drama about a player of traditional wooden xylophones)) from Chiang Mai 6 hours to Chiang Kong on the Mekong. You get dropped off at a bus stop 3 km away from the border so you have to take a tuk tuk the rest of the way. Unfortunately, the tuk tuk drivers here were very organized and coordinated so you couldn't negotiate price or play one off another. They also would only take one passenger per vehicle. While they did seem a little smaller than the tuk tuks in Chiang Mai and Bangkok, I still think that was a minor scam. Plus they dropped the three sets of tourist couples off at a tourist agency trying to sell visas and boat/bus tickets for the other side instead of at the border, which was another 300 meters down the road. We earned a negative experienced traveller point by letting the tuk tuk drivers go with their money (they said the tourist agency would drive us the rest of the way) instead of insisting that they took us to the border as we were paying for. However, we earned back a point by quickly figuring out the score and not buying any tickets from the agency. It appeared that they were trying to sell us a ticket that Lonely Planet said should be around $7 for $11. While that might not seem like a big difference to you all at home, it's a 50+% surcharge ripoff here and not what you want to fall for. So we just said thanks, but no thanks and trudged the last 300 meters to the border in the sweltering sun. Thai immigration was easy, and then we headed down to the bank of the Mekong to be ferried over to Laos. Ironic that our first 'overland' border crossing in Asia was actually over water! It was a cool feeling to be out on this tiny boat piloted by a wizened old man so close to the river level and watch Laos approaching. Once there it was cake to get through immigration (as we had already gotten our visas in Bangkok) and find a guesthouse room. Before we knew it we had found a place with a riverside cafe and spent the late afternoon and evening drinking (we're in Beer Lao country now!) and eating and playing cards and journal writing and watching the sun set, twilight arrive and stars come out over the Mekong. It was amazing how abrupt the transition to a slower pace was as soon as we crossed the border into Laos (see photo at the top of the entry). I think we're going to like it here. btw...on flickr I've also added some pictures from new year's eve in Chiang Mai and some market pics (which should also be under the Cuisine tab) for those of you who like to see those sorts of things. They'll be after the Laos photos that are up so far.